Wanco Light towers are a trusted source of light at jobsites across the U.S. With state-of-the-art technology, these light towers are in demand for the superior illumination they provide. A better light source requires a better engine, which is why Wanco chooses Perkins Pacific to provide Perkins Tier 4 diesel engines for their products. Perkins Pacific powers Wanco with engines properly sized to keep the towers’ LED lighting running on jobsites when they’re needed most, and with fuel efficiency higher than competitors. Working in conjunction with the Wanco team, Perkins Pacific has provided power system solutions that allow longer runtime before refueling (up to 225 hours on certain models), ultra-quiet operation, and lower carbon footprint for environmentally friendly operation. 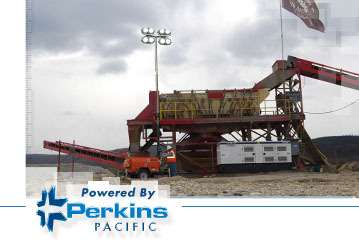 With Perkins Pacific as a partner, Wanco is able to provide greater value to its customers. One customer that has taken advantage of Wanco’s superior light towers is Discovery Channel’s Gold Rush mining crew. The Gold Rush crew works in the remote Yukon wilderness, often with little daylight and in tough environmental conditions. Perkins Pacific and Wanco towers together provide dependable illumination and light the way in the Gold Rush team’s search for gold.